Mark Ronson's new album is sometimes bogged down by interesting but ultimately pointless instrumental interludes. But like anyone's record collection, Record Collection has more hits than misses. It's future pop with a foot firmly in the past. 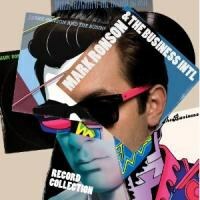 Mark Ronson & The Business, Intl. At every possible turn, superproducer Mark Ronson has talked up his work on the forthcoming Duran Duran album in the press. It's as though he's being paid by the word, but listening to his own new album, Record Collection, it's obvious Ronson is really more of a fan than even he's admitted. Ronson is a music nerd through and through, and he's put himself in a position through his production success with artists like Amy Winehouse and Lily Allen to field his own fantasy team when he puts together his own albums. On Record Collection, Ronson's third solo effort, the selection is as diverse as your own actual record collection, with on-paper options that seem incongruous until they're flowing through your speakers. Ronson's last album, Version, was primarily comprised of covers of indie hits past and present filtered through a retro-soul aesthetic. It worked if you're into that sort of thing, but not everyone was, and Ronson has confessed to hearing from humorless fans of the Smiths, whose "Stop Me If You Think You've Heard This One Before" sung by Daniel Merriweather sat alongside covers of songs by Radiohead, the Jam, Kaiser Chiefs, the Zutons, and...err...Britney Spears. It's hard to understand what it is about Ronson that irritates his critics. Perhaps it's his ability to make mixtapes with real people, or his increasingly skinny ties and lapels, each more perfectly crafted than the last. But even though he probably sleeps on a pile of money Scrooge McDuck would pop his buttons over, Ronson really is a lot like those of us who've found themselves worryingly bordering on obsessed over a single song, or digging through digital or physical archives to find the next two-and-a-half minutes of aural bliss. Love him or loathe him, Ronson is a fellow music nerd, and Record Collection proves it. Much has been made of Ronson's cultural shift between his last album and his new one, though it's really nothing more than trading in one row of instruments for another. The beats, for better or worse, are pretty much the same. Three years ago, Ronson was really into horns, and now -- thanks to Nick Rhodes, apparently -- he's into synthesizers. Here's a confession of my own: Like Ronson, I'm a huge Duran Duran fan. Like Ronson, my tonsorial history has seen ozone-destroying forays into John Taylor-aping highs and lows, and my shoes were once so pointy I could have auditioned for the part of Rosa Klebb in a splashy dinner theater performance of From Russia with Love. And like Ronson, I never gave up on Duran Duran, even when they weren't cool. And, let's face it, some people never thought Duran Duran was cool. But Mark Ronson did, and he's spent the better part of the last couple of years flouting it to the world. Never mind the synthesizers, he's even got contributions from Simon Le Bon and Nick Rhodes on Record Collection, the former singing the most honest thing he's sung in the past 20 years on the chorus album's title track: "I only want to be in your record collection." Ronson's true gift, at least on his own records, is having an innate alchemist's understanding of what's going to work well in any given situation, no matter how patently ridiculous it might appear at first glance. It's why lead single "Bang Bang Bang" features Q-Tip and MNDR, or why Le Bon is paired up with Wiley, or why Boy George sings alongside Andrew Wyatt. It's not all '80s futuristic, though: "You Gave Me Nothing" is a synth-heavy nod to the his/her response of the Human League's "Don't You Want Me", with vocals by Wyatt and Ronson's latest female muse, Rose Elinor Dougall. Dougall, former singer for the Pipettes, also appears on the Afrobeat/synthpop album track "Hey Boy" and closer "The Night Last Night". The most curious track is possibly "Glass Mountain Trust," featuring vocals by D'Angelo on which the reclusive crooner sounds more Cee-Lo than "Brown Sugar." As on Ronson's last album, Record Collection is sometimes bogged down by interesting but ultimately pointless brief instrumental interludes. But like anyone's record collection, Record Collection has more hits than misses. It's future pop with a foot firmly in the past.